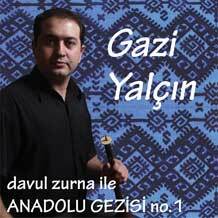 The first CD from this extraordinary musician, Gazi Yalcin, was released on 1st May 2002!! Here is a review of Gazi's CD from fRoots magazine, UK. The zurna is too often regarded as what musicologists term a 'low status' instrument, a fact which belies the high technical standards needed to play it well. Gazi Yalçin is an accomplished musician who performs with both power and imaginative delicacy. His playing is offset by an accompaniment on davul and fretless bass that is taken at a more restrained pace than is usual, allowing the listener to savour the well-constructed melodic lines and ornamentations. There are in particular two extended sequences of folk tunes, which, in Yalçin's hands, develop into fine, powerful pieces of music much more than the sum of their parts. This is real musicianship as well as great fun, and Yalçin may well be on the way to recreating the zurna repertoire.